NEW YORK (AP) Allen Crabbe had missed his last six 3-point attempts when he had another shot with the game on the line. A 40 percent career 3-point shooter, he just shrugged at his previous failures and let another one go that proved to be decisive. 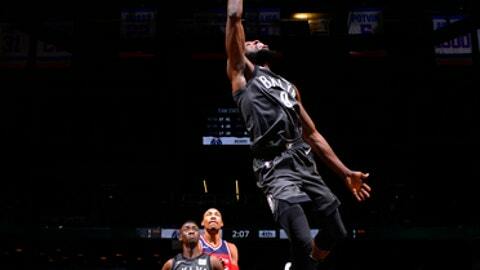 Rondae Hollis-Jefferson and Caris LeVert each scored 16 points, and the Brooklyn Nets overcame blowing a double-digit second-half lead and took advantage of a costly mistake by the Washington Wizards in the final seconds to pull out a 103-98 victory Tuesday night. ”I think it was just that I don’t care attitude. If you miss, you miss,” said Crabbe, who went 3 for 15 from the field, including 3 for 14 behind the 3-point line. Brooklyn shot just 10 for 43 overall beyond the arc. Crabbe raced from the corner opposite the Washington bench as Spencer Dinwiddie handled the inbounds pass and drew the defense of center Jason Smith and Bradley Beal, who lost Crabbe. Crabbe’s 3-pointer with 43.8 seconds left put the Nets up 100-98. Beal missed a potential game-tying pull-up jumper and Dinwiddie was then fouled, making one of two free throws to increase the lead to 101-98. ”I still have confidence in him,” Nets coach Kenny Atkinson said. A timeout by Washington advanced the ball past half court, but Tomas Satoransky was unable to inbound the ball in time, drawing a 5-second violation. LeVert then made two free throws with 7 seconds left to seal the win. The Wizards had already committed a couple of other miscues before Satoransky’s mental mistake, like not fouling with 9 seconds left in regulation. A few minutes before that, Beal turned the ball over and then committed a foul as he tried stopping DeMarre Carroll from scoring, giving him a three-point play. Playing at home for the first time in over a week after playing a game in Atlanta and two games in Mexico as the home team, the Nets returned to the Barclays Center and had a total of seven players score in double figures. Carroll had 15 points, Crabbe chipped in 13, Tyler Zeller added 12, and Dinwiddie and Jarrett Allen each contributed 11. Dinwiddie also had a career-high 12 assists. Beal scored 28 points to lead the Wizards despite making only 11 for 33 from the field. Kelly Oubre Jr. had 12 points and Otto Porter Jr. added 11 for a Washington team that dropped to 4-5 without John Wall. Beal thought the team had shown some type of growth but not constant enough with their floor leader sidelined. Wall was listed as questionable and went through his pregame routine but sat on the bench in his warmups. Wall has been out since Nov. 25 due to a sore left knee, but is expected to return Wednesday night at home against the Memphis Grizzlies. The Nets led 74-60 after Dinwiddie’s basket with 4:32 left in the third quarter before Washington went on a 10-3 run to close out the period, taking an 82-79 lead in the opening seconds of the fourth quarter on four straight points from Smith and Beal. But Brooklyn answered with a 10-0 run immediately, capped by LeVert’s 3-pointer that made it 89-82 with 9:05 to go. Both teams traded baskets the rest of the way before Beal stringed together three consecutive points to increase Washington’s lead to 98-97 with 51 seconds left. Wizards: Ended their five-game trip going at 2-3. Nets: Tallied 26 assists on 34 field goals. . The last Net with more than 12 assists in a game was Shane Larkin back on Feb. 1, 2016. He had 14 against Detroit. Atkinson does not have a timetable as to when Brooklyn’s recently acquired center Jahlil Okafor and guard Nik Stauskas would get into a game. The team used a Sunday workout and a practice on Monday to get to know the duo who was acquired last Thursday in a trade with Philadelphia. Wizards: Return home Wednesday to face Memphis, the opener of a four-game home stand. Nets: Host the New York Knicks on Thursday for the first time in Brooklyn this season. The Nets lost their first meeting with the Knicks, 107-86, on Oct. 27.